In addition to its picturesque natural beauty, music, dancing, and coffee, Colombia is also well-known for producing many different varieties of flowers that are long-lasting and of a high quality. Ideal climate conditions that include very fertile soil and 12 hours of sunlight every day of the year, in addition to lower production costs, make Colombian farms perfect locations for the production of this cash crop. In fact, Colombia is the second-largest exporter of flowers in the world, behind only the Netherlands, with more than 30 different countries importing their flowers from this South American nation. 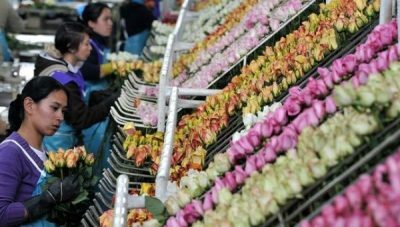 The flower industry employs over 130,000 people in Colombia and generates in excess of US$1-billion in revenue per year, making it the country’s fourth largest export product, after coffee, petroleum, and bananas. The U.S. is the primary market for Colombian flowers, accounting for nearly 80% of the country’s total flower exports. Americans also own approximately 20% of the flower industry in Colombia. Multiple flower-related businesses in North America earn a profit from each flower produced in Colombia, including importers, bouquet assemblers, wholesalers, supermarkets, online retailers and chain stores, while local workers receive only a small percentage of the proceeds. A majority of Colombia’s flowers are produced on farms located in either Bogota (79%) or Medellin (18%), because of their close proximity to international airports, which allows the flowers to be rapidly shipped to their final destinations. Each day, thousands of tons of freshly cut flowers are sent from Colombia to Miami’s airport on anywhere between 10 to 30 cargo jets, depending on the season. Once in Miami, they are shipped out on approximately 200 trucks per day to be quickly repackaged and sold in different parts of the country. The Colombian cut flower industry has received considerable American support since the early 1960s. During that period, Washington invested in fostering greater economic cooperation with a number of Latin American counties. In particular, President John F. Kennedy’s Alliance for Progress (AFP) and the U.S. Agency for International Development (USAID) played significant roles in this strategy by exerting soft power in those Latin American nations where the US was seeking to establish itself as an “international police power”. AFP was a 10-year, multibillion-dollar aid program targeting Latin American countries, whereas USAID sought to support economic growth and progress in the agriculture and health care services sectors, while also promoting democratic institutions and democratic forms of governance. The impetus for the establishment of the AFP and its involvement in Latin American countries, in conjunction with USAID,was the success of the Cuban Revolution in 1959, which culminated in the overthrow of the oppressive regime led by Fulgencio Batista, who ruled the country as a dictator with full US backing. This led to the Americans losing their considerable influence over the island. More importantly, this outcome made the US leadership paranoid that other countries situated in their “backyard” might follow Cuba’s example and revolt against US-supported dictators and regimes, nationalize businesses and resources, and establish closer ties with the Soviet Union.Washington used the AFP and USAID as mechanisms by which to improve trade ties with Latin American countries with the ultimate objective of preventing the spread of communism in the region. President Kennedy actually visited Bogota in 1962 and endorsed the AFP. During the 1960s, the AFP and USAID provided technical assistance for various agricultural-related projects in Colombia, including some that supported the flower industry. Subsequently, the first shipment of cut flowers was exported from Bogota to Miami in 1965, which marked the beginning of Colombia’s transition into the world’s second-largest exporter of this cash crop. 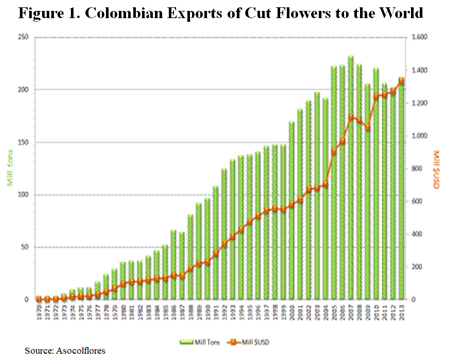 However, it was not until the late 1980s that Colombian flower exports began to increase at a more significant pace (figure 1). While the AFP and USAID played significant roles in the development of Colombia’s flower industry early on, US efforts aimed at reducing Colombia’s dependence on the drug trade by combatting cocoa farming and promoting legitimate economic activities had become a significant factor in the 1990s. On December 4, 1991, the US government enacted the Andean Trade Preference Act (ATPA), which eliminated tariffs on 5,600 goods imported from four Andean countries: Bolivia, Colombia, Ecuador and Peru. Subsequently, the US congress periodically renewed the ATPA to combat the drug trade with Latin America until October 31, 2002, when it was replaced with the Andean Trade Promotion and Drug Eradication Act (ATPDEA), which increased the number of goods exempted from tariffs to 6,300, but was otherwise largely similar to its predecessor. The ATPDEA was set to expire in 2007, but it kept being renewed for various durations with significant changes being made until the final version of the agreement lapsed on July 31, 2013. Before that happened, the U.S.-Colombia Trade Promotion Agreement (CTPA) was implemented in May 2012. This bilateral free trade agreement, which was originally signed on November 22, 2006, eliminated duties on 80% of consumer and industrial products exported from the U.S. to Colombia. The ATPA and ATPDEA facilitated increases in the volume of trade between the U.S. and the four Andean countries specified. However, while the ATPA and ATPDEA may have brought some benefit to he U.S. economy and its consumers, they did not achieve their ultimate objective of reducing cocaine production in those Andean countries, mainly Colombia,which was identified as the source of over 90% of the total cocaine deliveries seized by the US Drug Enforcement Administration (DEA) between 2015 and 2016. Nonetheless, the ATPA and ATPDEA, as well as the CTPA, played important roles in increasing the total volume of Colombian flower exports to the US. 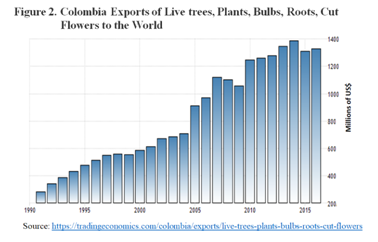 In fact, Colombia has significantly increased its export volumes of live trees, plants, bulbs, roots, and cut flowers since the ratification of the ATPA in 1991 (figure 2). 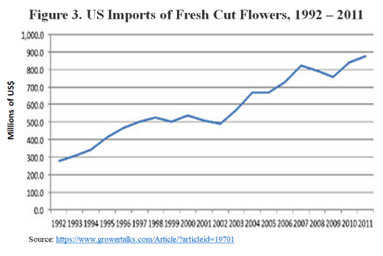 American cut flower imports have also increased significantly during that time (figure 3). Unfortunately, there is some evidence to suggest that the ratifications of the ATPA, ATPDEA and CTPA may have also contributed to the decline of the US cut flower industry. For instance, the production of domestic roses decreased 95% between 1991 and 2015 (figure 4). US-based greenhouse flower producers cannot compete with Colombian flower producers, who are able to mass produce flowers year-round. 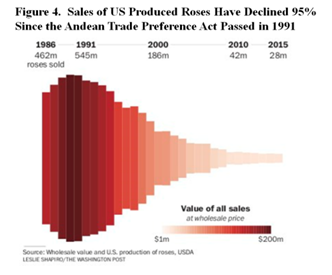 However, while US production fell in the years following the implementation of the ATPA and ATPDEA, the flower industry has created hundreds of thousands of jobs in both countries, on account of the production in Colombia and redistribution in the U.S. Most of the flowers that Americans purchase are produced, assembled and packaged thousands of miles away in Colombia. Given that Colombia possesses perfect growing conditions and lower costs of production, it is not surprising that the country is able to produces greater volumes of higher quality flowers more rapidly than the US. However, producing flowers at such high volumes in order to satisfy the demands of a very large market engenders its own controversies. For example, while deadlines in Colombia’s flower industry are generally strict all year, conditions worsen for local workers in the few weeks preceding high demand periods like Mother’s Day and Valentine’s Day. During those high demand periods, local employees work in excess of 100 hours per week, arriving before sunrise and remaining there until very late in the evening, fumigating, cutting flowers, clipping thorns, packaging, and shipping their final products to North American countries, where consumers will now have the means to share their expressions of love and appreciation. Female workers, which make up almost 70% of the workforce in Colombia’s flower industry, often experience injuries or face sexual abuse in the workplace. At the end of the month, after enduring abuse and severe working conditions, while being potentially exposed to 130 different types of hazardous chemicals in the pesticides that are used, each of those workers makes around US$260, which is below Colombia’s minimum wage of around US$300 per month. Many of the pesticides and fertilizers used in the flower industry are carcinogenic and toxic.In addition to being detrimental to the health workers, these chemicals also cause irreversible damage to the environment, including to the air, land, biodiversity, and particularly the water supply, as many of those pesticides and fertilizers often end up in lakes, rivers, groundwater sources, and eventually the ocean, where they can damage marine ecosystems. Despite the fact that Colombia possesses an ideal climate for year-round flower production, thousands of acres of climate-controlled greenhouses are employed because the flowers require artificial light, heating, and cooling during their growing cycle. Additionally, refrigerated warehouses and trucks are needed to keep the cut flowers in the best condition possible during storage and transport. This combination of greenhouses, and refrigerated warehouses and trucks represents a significant source of carbon dioxide (CO2) emissions, particularly when considering that some of these greenhouses are massive structures, often covering areas that are equivalent to multiple football fields. Subsequently, more CO2 emissions are generated when the cut and packaged flowers are shipped abroad thousands of miles via airplane and trucks; once they have arrived to the importing country, they will once again be stored in refrigerated warehouses awaiting distribution. As such, it should come as no surprise that flower consumption is responsible for tens of thousands of metric tons of CO2 emissions during the weeks preceding Valentine’s Day and Mother’s Day each year. The success of the flower industry in Colombia is an outcome of the economic and political agenda of US, which enacted a number of policies aimed at preventing a socialist revolution from taking hold in the country during the Cold War Era and winning the so called War on Drugs. These measures, which facilitated the emergence of free market capitalism in Colombia, led to massive changes in country’s flower industry and transformed Colombia into the second-largest exporter of flowers in the world. However, there are many aspects of Colombia’s flower industry that have raised concerns, including physical and sexual abuse in the workplace, and its detrimental impacts on the environment such as CO2 emissions, the degradation of soil, the pollution of water sources, and the loss of biodiversity. In recent years, there have been increasing demands for fair-trade flowers, which would entail improving working conditions within the flower industry and reducing the destructive environmental outcomes associated with it. While there have been some modest improvements in terms of protecting worker rights, limiting pesticide usage, decreasing the amount of water used during the production process, and reducing energy consumption during transportation, the nature of the business and its products makes it unfeasible to transform the industry in a meaningful manner that would substantially lessen its ecological impact. The reality is that as long as consumers continue to regard flowers as symbols of love and appreciation, the production and distribution of cut flowers will likely persist without significant reforms to the industry. That means significant CO2 emissions will continue to be generated on account of the large, climate-controlled greenhouses, and refrigerated warehouses and vehicles that are required to grow, store and transport the flowers under ideal conditions. The excessive application of pesticides and fertilizers will also continue to poison the environment to the detriment of the health of workers, while the industry continues to extract large amounts of water, all of which are necessary to grow varieties of flowers that are not native species to the area. Perhaps if Western consumers knew about the realities of this destructive industry in the distant lands that produce the flowers, they might not be so inclined to present flowers as symbols of love and beauty, knowing that the recipient of their gift might be aware of the legacy that they actually represent. Much like the U.S., the majority of cut flowers sold in the Canadian market are imported from Latin America, mainly Colombia. Some of the chemicals found in the pesticides and fertilizers applied to the flowers grown in Colombia have been linked to neurological damage, headaches, cancer, Parkinson’s disease, etc. The application of pesticides and fertilizers have killed many insects and organisms, including honeybees.